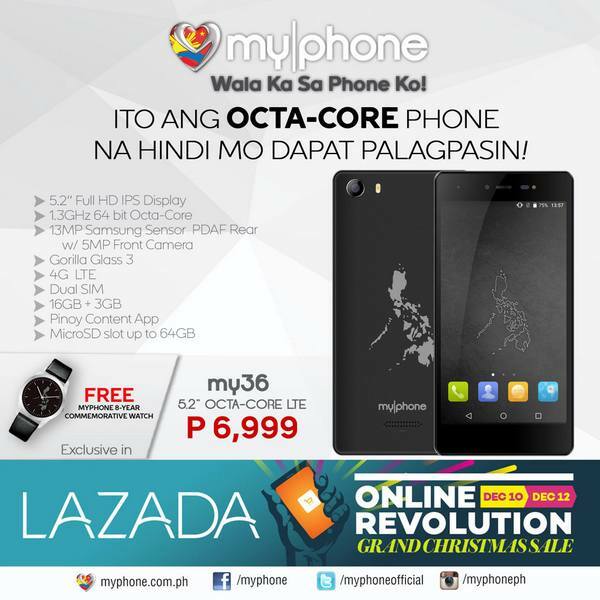 MyPhone has launched My36 exclusively at Lazada on December 8. MyPhone My36 sports a bolder, bigger and clearer visuals with 5.2" display and packed with high definitive resolution of 1080 x 1920p. My36 is equipped with a built-in 1.3 GHz MediaTek MT6753 Processor and a huge 3GB RAM that makes this unit more than capable of handling basic phone functions, app launching and even multitasking with ease. This phone has dual cameras for creativity and connections, a 5MP front camera and 13MP Samsung Sensor Main Camera with Phase Detection Auto-Focus rear camera. Furthermore, it is a member of the Android flagship with its 5.0 Lollipop operating software.